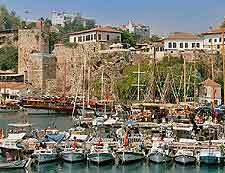 Antalya celebrates all of Turkey's national festivals and major events, including those on the Islamic calendar, the dates of which vary from year to year. The city of Antalya also has a number of its own festivals, which are unique and designed to promote the city or celebrate its distinctive cultural characteristics. The highlight of the Muslim calendar is Eid ul-Fitr, as it gives locals a chance to kick back after the fasting of Ramadan. Of the non-religious events on the calendar, the 18-day Antalya Festival in September is a big one, offering plenty of things to do for all the family.